This is Rimsha, a college student from San Antonio, Texas, and her 11-year-old sister, Romesa. Both sisters have always wanted a cat to call their own, Rimsha told BuzzFeed News. Their family has had fish and birds before, and had a cat named Pepper for a few months. However, they had to give Pepper away. Rimsha said she has always begged her parents for a cat, and now her little sister has taken up her cause. “She had the same love for cats and she really wants to adopt one,” she said. Recently, Romesa decided to take her pleas up a notch. She wrote her parents a six(!) 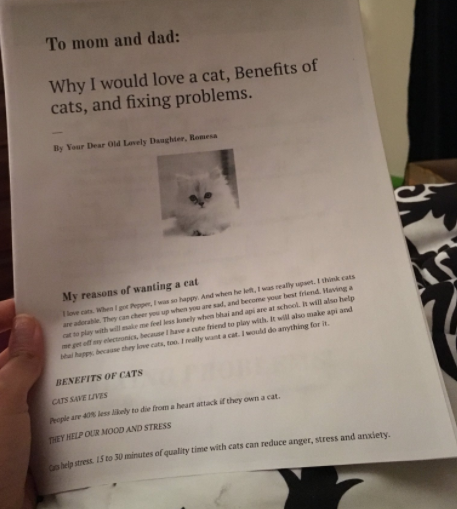 page report on why they needed to get a cat. She wrote the whole essay in an hour. Romesa told BuzzFeed News that her dad has always encouraged her to write reports. “I thought I would write a report about a cat because that's what I really want,” she said. She added she loves to write, so it was easy to come up with the six pages. She used the internet for research.